Dr. Ganoune Diop, Secretary General of the International Religious Liberty Association (IRLA), addressed a diverse group of public and religious representatives who came together in Moscow to consider shared international concerns. Participants at a high-level religious freedom conference in Moscow have pledged to fight the growing “perversion of religion” around the world by those who use the language of faith to justify violence and terrorism. The rare gathering of leaders from across Russia’s religious and political spectrum met October 29 in the Great Hall of Moscow’s President Hotel, and included scholars, public officials, and religious leaders representing the Orthodox, Protestant, Jewish, Catholic, and Islamic communities. 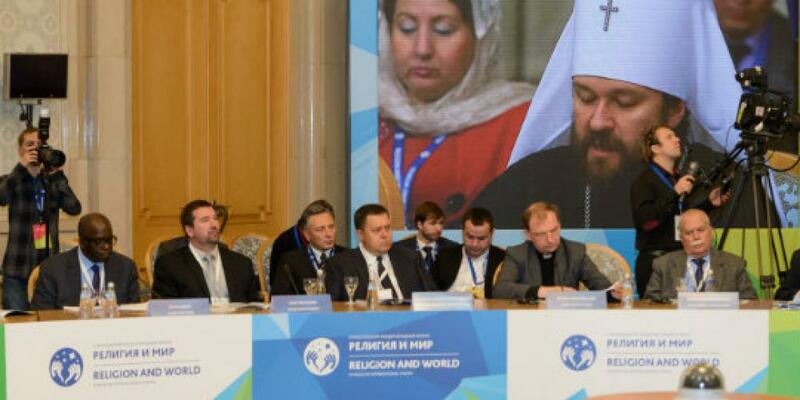 The event, the Third International Forum on Religion and Peace, was jointly organized by Russia’s Presidential Council for Cooperation with Religious Organizations, and Moscow’s department of National Policy, Inter-Regional Relations, and Tourism. It was supported by Russian President Vladimir Putin and Russian Orthodox Patriarch Kirill of Moscow, along with other religious and public leaders. Pastor Franklin Graham, son of well-known evangelist Billy Graham, attended the forum, along with Metropolitan Hilarion, director of the Department for External Church Relations of Russian Orthodox Church, and Sheikh-ul-Islam Allahshukur Pashazade, chairman of the Caucasian Muslims Office. The IRLA was represented by Secretary General Dr. Ganoune Diop, and by Oleg Goncharov, who heads IRLA’s partner association in Russia. On the day before the forum, Diop and Goncharov visited the national Duma, or parliament, to meet with various public officials responsible for church-state relations in Russia. They also met with Alexander Kudryavtsev, who heads one of Russia’s most active public organizations focused on religious liberty, the Russian Association for the Protection of Religious Freedoms (RARF).